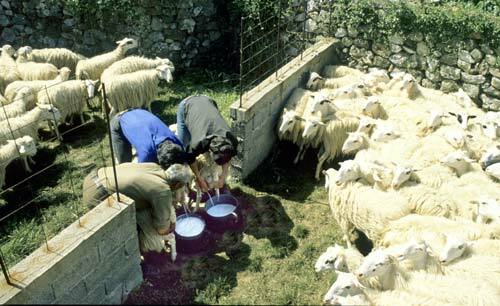 On Saint George’s day in the village of Asigonia in Crete, the shepherds bring all of the herds down from the mountains to have them milked. Then the milk is given freely to anyone who wants some. The village priest then blesses the herd to keep them safe for the coming year. Of course the herds are milked every day but then the milk goes to the village co-operative cheese making factory right there in the village. 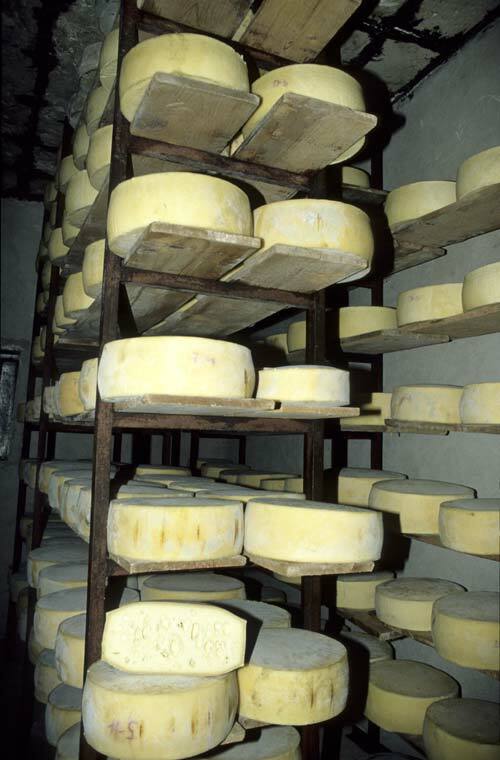 At the back of the factory is the storehouse for the cheese where it is left to mature. The cheese that they make the most of is the delicious Cretan Graviera. Finally here are the great graviera cheeses stacked high. This entry was posted in Local Culture, Places and tagged Crete, Graviera, milking sheep, St George. Bookmark the permalink. I think that’s a nice idea to give the whole community milk on St. George’s day – very friendly ..
wonderful narrative, free milk excellent idea for the community. Sheep milking is an activity I have never seen. What a beautifully written and photographed post! I enjoyed it very much! The 2nd picture is too funny!Was it meant to be? Oh how wonderful! Great shots and great explanations! My M entries are posted here and here. Please drop by if you have time. Thanks a lot! I’ll look forward to taste the cheese. 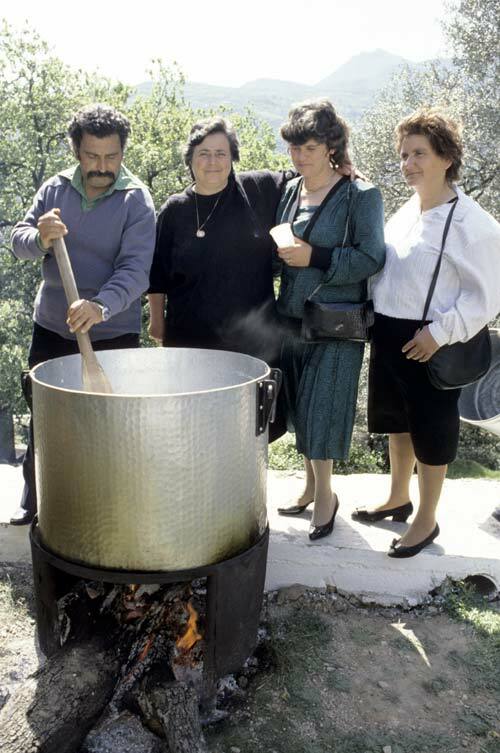 this an excellent post, ray – you’ve shown everything important in the ritual of cheesemaking, even the ladies in their smart clothes showing up at the blessing ceremony! I wonder why sheeps milk isn’t sold regularly, as goats milk is. Of course, here, we drink cows milk more than any other. Thank you for visiting Belgrade today and allowing me to find your wonderful site/photos. I too especially like the rear-end shot of the milkers, and that very handsome priest. I love cheese, and adore Greece that I’ve visited several times, but not Crete yet. My son and girlfriend were just there, and I can hardly wait to go. How could I forget the CHEESe part and Milk for M? Great post you made here Ray, its indeed fantastic 🙂 to see the process of making. This is very interesting ! 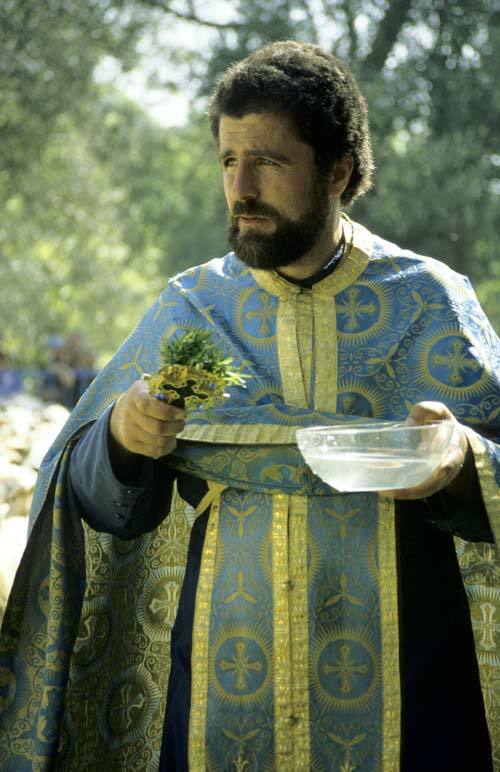 I had no idea how sheep were being milked, and the whole process of pasteurisation and then the blessing of the village priest is also new to me! Thanks! That second photo is priceless but my favourite is the photo of the village priest. Love the shot of the milking. Funny. I’m not too sure I have ever had Sheep milk cheese. It sounds delightful. This is a great post! Love the photo of the five getting milked…. St. George’s Day, you say? Then that would definitely be my favorite feastday in Crete. I love these sheep of yours, love the sherpherd butts, love the priest, the wheels of cheese, the people!! What a great story. 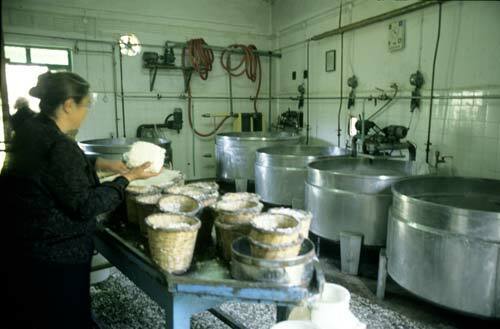 I worked a year and a half in the cheese dairy of a big sheep farm in Israel and loved the hard work where everything was while. So you can understand my excitement to see your post. And Ray, thank you for your kind words about the moon here, rising over the mystical dark woods. Feedback like that from you is taken very seriously.